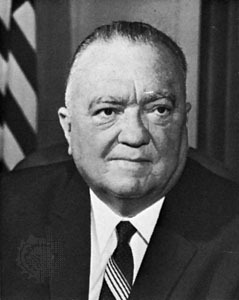 Perennial pretty-boy Leonardo DiCaprio is aged 20-or-so years and rendered barely recognizable as former FBI strongman J. Edgar Hoover. DiCaprio tweeted a link this week to new still pictures from his upcoming movie “J. Edgar” that show him portraying Hoover later in life. The pictures – that also include shots of director Clint Eastwood working with DiCaprio behind-the-scenes – show a remarkable resemblance. But fear not, those who couldn’t suffer an entire movie with DiCaprio’s leading-man looks obscured; he is clearly himself in earlier scenes portraying Hoover as a younger man. The biography is scheduled for theater release Nov. 9, according to IMDB.com. It tells the story of Hoover who was FBI director from 1924 until his death in 1972. DiCaprio isn’t the only A-list Hollywood actor to star in a movie that obscures the attractiveness that helped make them stars in the first place. And that’s always fun. To see an actor transformed into something completely unexpected is one of the classic joys of cinema. Too often, actors reside in safe zones that don’t challenge conventional perceptions. It’s always refreshing to see an actor step out of that box and do something different – something that allows viewers to fully appreciate their performing ability. The Dark Knight: Heath Ledger (The Joker), 2008. The Hunger: David Bowie (John), 1983. How The Grinch Stole Christmas: Jim Carrey (The Grinch), 2000. Hook: Glenn Close (Gutless), 1991. Tropic Thunder: Tom Cruise (Les Grossman), 2008. Shadow of the Vampire: Willem Defoe (Schrek), 2000. Raging Bull: Robert DeNiro (Jake La Motta), 1980. Edward Scissorhands: Johnny Depp (Edward), 1990. Harry Potter and the Goblet of Fire: Ralph Fiennes (Lord Voldemort), 2005. After the Sunset: Salma Hayek (Lola Cirillo), 2004. Any, or all, of these great flicks would do nicely to pass the coming weeks until DiCaprio’s “J. Edgar” hits theaters. Edward Chipotle writes about technology and movies – two of his favorite subjects. When he isn’t enjoying a dark movie theater, Edward can be found Metrofax online faxing to celebrities and other known entities, he hates to call and only uses fax to reach out to big celebrities.